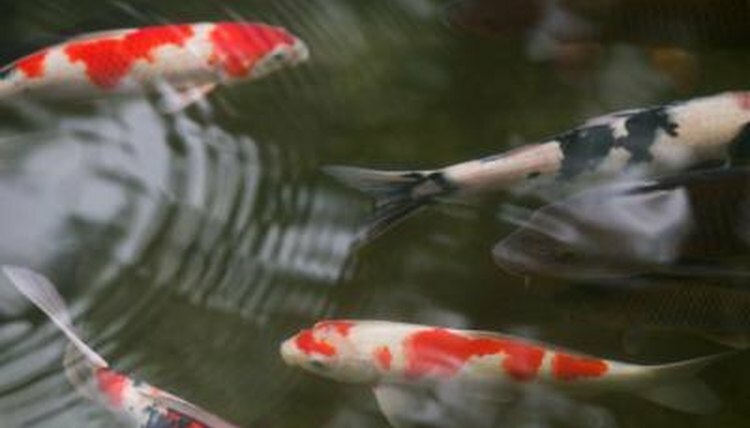 It is easy to see why barrel filters are popular for goldfish and koi ponds: They are inexpensive, customizable and effective. A few commercial designs exist, but most pond enthusiasts design and build their own. Some hobbyists may lack the skills, patience or desire to build their own barrel filters; but others find them simple and flexible to design, and worth the required effort. Sometimes, enthusiasts use multiple barrel filters to maintain large ponds. Aside from a clean, chemically nonreactive plastic barrel, you need a powerful pump and some filter media to build the filter. The pump you use must match the size of your pond and the capacity of your filter; consult a pond-building professional to determine the right pump for your scenario. Pond enthusiasts utilize an enormous variety of filter media -- popular choices include lava rocks, synthetic-fiber-based pads and commercially produced media. Miscellaneous items for the project include PVC pipe, PVC fittings appropriate for your specific design and aquarium-safe silicone to use around the fittings. Barrel filters are essentially large canister filters; they remove water from a pond, pass it through filter media and return it to the pond. Nevertheless, they are flexible, and hobbyists have created many variations on the basic format. The simplest designs accept water through an inlet pipe near the bottom. A platform made of rocks, cinder blocks or a PVC frame sits just above the inlet pipe and holds the filter media. This allows water to enter the pipe and flow directly through the media. An outlet pipe, near the top of the barrel, returns clean water back to the pond. A third pipe near the bottom of the barrel forms the wastewater valve, which allows the user to drain the murky water from the bottom of the filter with ease. No filter is perfect for all situations, and barrel filters are no exception. While barrel filters are more affordable than commercially produced filters, they require considerable time and effort to construct. Sometimes, hobbyists grow frustrated from newly completed barrel filters that fail to function properly. Though it is often possible to tweak the design of a nonfunctioning barrel filter until it works, it may require extended experimentation and adjustment to find the solution to the problem. If you have a large pond you can use several barrels simultaneously rather than one large, commercial filter. When using more than one barrel, plumb them in a parallel configuration rather than serially or inline. While a single faulty barrel can cause a chain of serially plumbed barrels to fail, a faulty barrel in a parallel configuration does not affect the other barrels' productive ability much if at all. Additionally, you can temporarily disable individual barrels in such a system, thus allowing you to tend to a filter without disrupting the other barrels in use. What Kind of Filter for a Hexagon Fish Tank?